Myself and good friend Bryan Janosick drove to Kingdom Come State Park located on Kentucky's Pine Mountain since we were passing by on our way to Breaks Interstate Park! 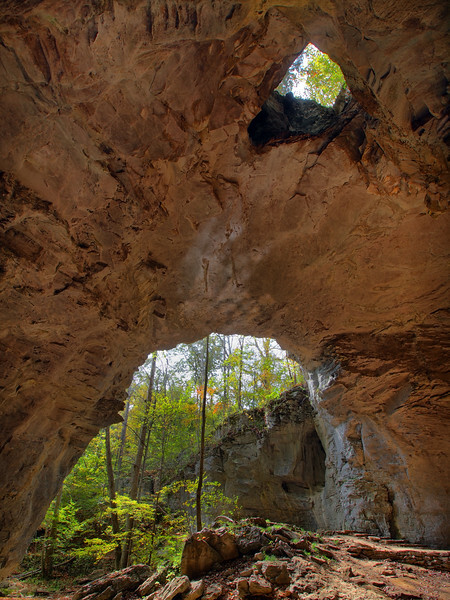 Within the park resides Log Rock, an arch with a 60 ft span on top of the ridge. Some interesting things I noticed about this arch is that it looks much larger from below near the parking area than it does from this perspective. Standing above the arch it really does look like a big log, hence why it got it's name. Though I'm rarely a fan of man made objects around natural formations, there was nothing I could do in this case so I just went with the flow and ended up enjoying this perspective a lot! It was really windy when we visited so hopefully my next visit things will be a bit more calm!